If I could give this recipe 6 stars I would. Loved it. However, I will add an extra chile next time. Great dish, but shredding the papaya takes some time. Taste your chile first. Mine was exceptionally hot, so I should have scaled back. Delicious although a bit to spicy for everyone at the table. I will try it again with just 1 birds eye chile. A good way to dress up a can of tuna, but better for lunch than dinner IMO. I wasn't sure I loved the ginger element. He says you can sub just about any vegetable and I used baby chinese broccoli. They were delicious cooked this way. I did have a lot of liquid in the dish, and I think I should have done a better job draining the blanched veg and cooked the dish less. Alternately, I may be able to shorten prep time further by including the sugar with the rest of the sauce ingredients and leaving out the final 1/4 cup water. 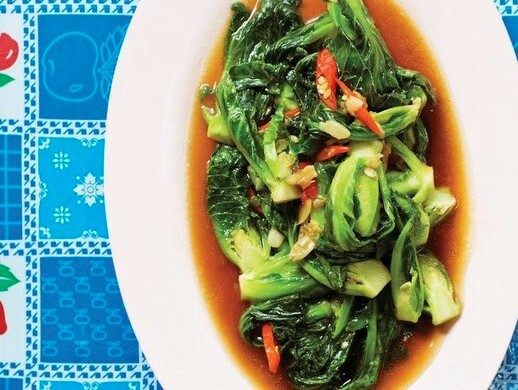 I used baby bok choy and this was delicious. I did leave my bok choy out for about 30 minutes to dry in a towel to make sure they didn't water down the lovely sauce which has just the right balance of umami, heat, and sweetness. Easy, quick side. p. 91 -- This was so quick and easy, and super delicious. I used brussels sprouts but will definitely have to try with other veggies as the sauce is great and just a few ingredients. I only used a splash of water, not stock, and I measured the chiles by weight as mine were on the large side, and it ended up being the perfect spice level for me. I can't wait to make this again. I used half and half mushrooms (king oyster and shimeji) and young chinese broccoli, also added extra shrimp. This was a good dish but I preferred the brussels sprout stirfy, which is gutsier. We LOVED this. I used ground pork, long beans, and Thai basil. Also sweet soy instead of black soy, omitting the additional sugar. To make for a family of four, first, I batch cooked the eggs in a cast-iron skillet. Then in the wok I made a single portion for the kids with no chiles followed by a double batch for the adults using 4 fresh and 1 dried crumbled chile. Next time I will add one chopped fresh red chile in the kids' portion and 1 additional fresh and dried chile to the adult portion. 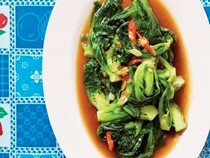 We also loved this, and we also substituted thai basil and green beans. Spice wise we went with just 1 dried chile, which we removed after cooking, but could have gone with two. Comes together very quickly and is packed with flavour. Made this with ground pork and the Holy Basil. I tasted my fresh Thai chilies first and as they were hot, used only one. I went with the full amount of dried. This was very, very tasty and a definite repeat. Delicious and easy. I had to make two substitutions. I used Thai Basil instead of Holy Basil. I used green beans instead of long beans. The dish has a lot of heat, but plenty of flavor. This is a great recipe. The coconut rice is so delicious. I cooked it on the stove-top and needed to add an extra 1/4 water for perfect texture. Next time I will try it with a frozen cube of creamed coconut instead of boxed coconut cream. The pork was very good but took longer to cook than stated in recipe. I had to spread the cooking time over two days. That said, it was delicious. It is intensely sweet and salty so a little goes a long way. The som tam is so good, it just blew my mind that I made it myself in my own kitchen. Very authentic flavor, much better than the Americanized versions found at most restaurants. A nice one-plate meal, where the flavors of each component compliment the others perfectly. The pork and the rice are incredibly easy to make, and absolutely delicious. 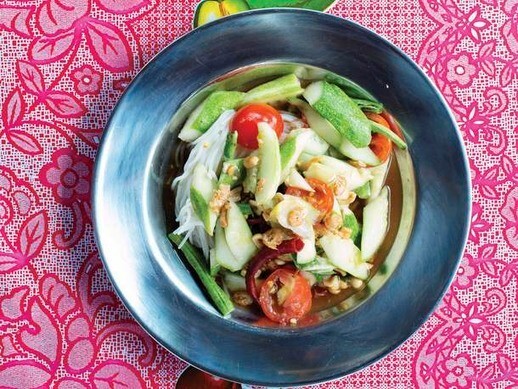 The papaya salad is a tart and spicy offset to the sweetness of the pork and rice. The pork recipe could be easily adapted to the slow cooker (cook with lid on and then lid off to evaporate juices). A lot of bang for the buck, flavor-wise, in this one. Worth the price of the book. Great combination of flavors. I don't have a rice cooker so I made the coconut rice on the stove. It needed a bit more liquid as the rice was on the dry side. This wasn't a big success for me. I cooked a double portion in my wok and it was overloaded -- couldn't get a good sear on the noodles. This one doesn't work well scaled up for family dinner so I won't be repeating this dish. Didn't find any fresh rice noodles so I did use a large wheat noodle and it still worked very well. I tripled the recipe and cooked in two batches. The flavour profile was nice and very thai eventhough I used Chinese soy, and it came together relatively quickly. I would still serve with something else on the side as it is a bit light for one person I find. Also, the dish definitely needs the pickled chillies as the acid and heat really take it up a notch. p. 218 -- I've been looking for a good pad see ew recipe for a while as that's my go-to Thai takeout order, and this was pretty great though I may tweak it a bit next time. It has a fair number of ingredients but all comes together very quickly in the wok once you have everything prepped. I used regular canola oil instead of garlic oil, thinly sliced pork belly for the meat, and regular American broccoli cut into small florets as that's what I had on hand. I did wish there was a little more sauce in this, and I ended up drizzling a little more of the black soy on at the end and then a bit of sriracha, which was great. I'm not sure the added tsp or so of sugar is really necessary as the black soy sauce (I used Healthy Boy brand) is already quite sweet, so I may omit that next time. This is delicious, but heavier on the meat and lighter on the noodles than I prefer. I doubled the noodles and dressing, left the meat quantity about as written. I used the Vietnamese pork roll as called for, but I'm not sure I'd bother in the future. Meats could be varied. Sadly I couldn't find any duck at the market so I modified the recipe to use chicken legs. Even without the duck flavor this is a great soup, very earthy but not too heavy. The prep has a lot of steps, but the end result is well worth the effort. Was excellent. I used Vietnamese cinnamon. great recipe. Took a while to get all ingredients ready, not a quick noodle dish! Agree with Delys77 that the slivered pork at the end did not add anything. The stewed pork alone would be enough. I did like the sprouts in the dish. I made the following modifications, used half as many pork balls and sliced them in half, omitted the sprouts and tripled the water spinach (You choy in my case) and lastly substituted basil for the sawtooth herb. The broth was delicious and the and the stewed pork was lovely. All the herbs and greens were also a welcome addition. A great dish except I think it could be done so that you have enough broth and pork for 4 (instead of having left over broth and pork), plus I'm not sure the slivered pork that is boiled at the end added anything to the dish. I would likely ommit these, increased the stewed pork, and still omit the sprouts. I would also consider going with about 75% of the suggested chili vinegar and ground chili as the broth was a bit too spicy. I used true cod fillets and key limes, cilantro stems instead of roots, chicken demi-glace instead of pork stock. I also shortened the cooking time to 10 minutes for the fillets. I have to say we were fairly wowed by this dish. The mild cod fully absorbed all the flavors of the salty, faintly sweet liquid; the garlic and Thai chiles added the perfect punch. To go along, Mr. NS made a stir fry of snow peas, carrots, mushrooms, garlic, and oyster sauce. I made cocktails of ginger vodka, key lime juice, and Thai basil Som from Pok Pok. 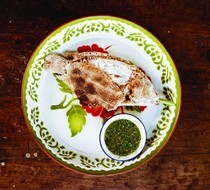 The fish is probably the easiest dish I’ve made from this book, and, all told, this was a stellar meal. I modified this quite a bit to suit out tastes and what we had on hand. I went with 1 fresh thai chile, no fermented fish sauce or dried shrimp, and I simply bashed it up in a ziplock as my large mortar was being used for another dish. The end result may have been a bit different than the author intended but it still screamed thai and was simply delicious and refreshing. A quick easy side for a complex thai menu. Doubled the salad and dressing but kept it a two eggs, then served over rice as a light dinner for two. The dressing is delicious and the egg adds a nice richness. Seems odd with rice but it really works. The sauce for this is delicious. I didn't have any tamarind water so I went with half paste and half water. The fish itself was very tasty, but I did find it a bit challenging to eat. Our fish was meant for two and was a little over 1 lb, but this left fairly little meat, I would say 2 lbs is the minimum. That said, might be hard to find a vessel to cook a fish that big. This wasn't a winner for us. The broth is far too fiery and far too medicinal. That quantity of galangal and turmeric called for makes the soup taste like something a doctor would prescribe. I had to cut the broth with lots of chicken stock and even then there were strong lingering notes of the pharmacy. I fudged it a little by starting with regular chicken stock, to which I added the pork neck bones and the other aromatics. I only had about 1.5 hours and wanted to make sure I had a flavourful base, hence the augmented chicken stock cheat. That said, it worked very well, yielding a lovely broth with hints of ginger and herbs and was quite substantial with the rice and pork balls. I didn't do the eggs however as the suggested method of poaching in a small container yielded a barely cooked egg. In future I would just do soft boiled eggs the traditional way. Made this a few times, perfect comfort food, deep and flavourful broth. Almost like a dry version of the boat noodles with peanuts and wheat instead of rice noodles. That said, this was very good and is a nice simple alternative to the boat noodles. I simply cooked the noodles all together and then cooked the other components of the dish in a separate pot, then divided between the bowls. Overall super flavourful and relatively easy on a work night. Couldn't find any cilantro root so I just used the stems which proved to be difficult to turn into a paste with the pestle, next time I would just use the mini processor. Flavour wise this was excellent, with a slight herbal note and tonnes of umami. I did it on the stove top in a LC saucier and the bottom caramelized very nicely after about 12 minutes. The only challenge was that the shrimp were overcooked (shell on without head). Next time I might use jumbo shrimp or possibly cook them separately as they were quite rubbery by the time the pork had caramelized. The dish still works great without the rice powder, which is the most labor intensive part of this dish. If you are not spice tolerant, you might be happy using half as much of the Phrik Phon Khua (Toasted-chile powder) as the recipe suggests. My second time making this - its a great use of leftover rice and makes a fabulous breakfast. I used ground pork but made no other substitutions. Wonderful layered flavor but a bit salty probably because I left the game hens in the brine too long. Next time I will be very careful with the timing to make sure that each step falls into the correct time of day so that it will all come together in one day and be ready to cook for dinner. I grew some lemongrass just for this recipe in a pot and used it. I also made the garlic oil to baste with but cheated on the dipping sauces and just served it with Thai sweet hot chili sauce. Wow this was so good! I was looking for something to use of bits of leftover ingredients, including coconut milk and sweetened condensed milk, when I stumbled onto this recipe. I also had some homemade peanut sauce in the refrigerator to use up along with some boneless, skinless chicken thighs. I figured that if it works for pork it will work for chicken and it did. Luckily we have one grocery store in town that sells things like the fresh turmeric and galangal along with lemongrass. I pounded the chicken to 1/4" thickness and cut each thigh in half before threading them onto skewers. We grilled the skewers over charcoal and I made the Ajaat (Cucumber Relish) that is recommended as a condiment along with peanut sauce. The recipe was quite easy and the flavor was wonderful. My husband was very impressed. This would be a good dish to make for a dinner party as I think you could grill the skewers ahead of time and keep them warm for a little while in the oven. Really good. Need to work on my grilling skills. Maybe leave the cover open next time. I used Persian cucumbers and this worked out really well. Used an English cuke. Maybe make thinner slices next time. Amazing!! Salty, sweet, and just yum. Will make a lot since the Pandan leaves are frozen! Couldn't find tamarind paste/pulp, so I used wet tamarind. Bought it at TF. While making the paste is a bit of work (I cheated and used a FP, not a mortar and pestle), you end up with enough for 3 recipes worth... so... my freezer is stocked for two more dinners now! Then, just slather the paste on fish (I used Alaskan Yelloweye), cover with basil (couldn't find thai, used regular), wrap in banana leaves, and grill! This had a great flavor, from both the paste and the banana leaves and wasn't too spicy (I did sub guajillo for puya chiles, which cuts the heat a bit). Served with sticky rice and Fish Sauce Soaked Chiles (Phrik Naam Plaa) and Norther Thai Style Stir Fried Squash (Phat Fak Thawng). A fairly quick and easy stir-fry, especially if you prep the spice paste in advance. A bit of heat, but nothing unmanageable. We subbed butternut for delicata or kabocha squash. Definitely don't skip the fried shallots. Easy and delicious, especially spooned over sticky rice. Adding sliced garlic is optional, but we loved it with that addition and would serve that way in the future. Meticulous method delivers formidable, clearish stock that is useful for a number of dishes in the book, but I almost always use it to make Thai rice soup with bouncy pork balls. Love these sharp little meatballs poached in broth, good deep garlic flavour. 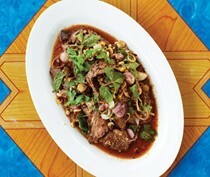 The beauty of Pok Pok is that it isn’t just a bunch of recipes. It illustrates the time the author spent immersing himself in Thai cuisine and the respect he shows to its people and culture. Thanks to meticulous testing, readers can make and serve food that, as Ricker puts it, "you'd be hard-pressed to find outside of Southeast Asia." ...one of the most exciting ethnic cookbooks to come out in the past few years, and one of the first since David Thompson's Thai Food to fully commit to a hands-on, no substitutions manner of cooking. The sweet and sour undertones of the sauce don't overpower the tofu or shrimp, instead blending harmoniously with the understated proteins. Despite the long ingredient list and recipe, this was actually an easy dish to prepare and the final result tasted remarkably like the the game hens I ate back in college. Brined Cornish hens are stuffed with lemongrass, garlic, and cilantro and basted with a honey-garlic-scallion oil. 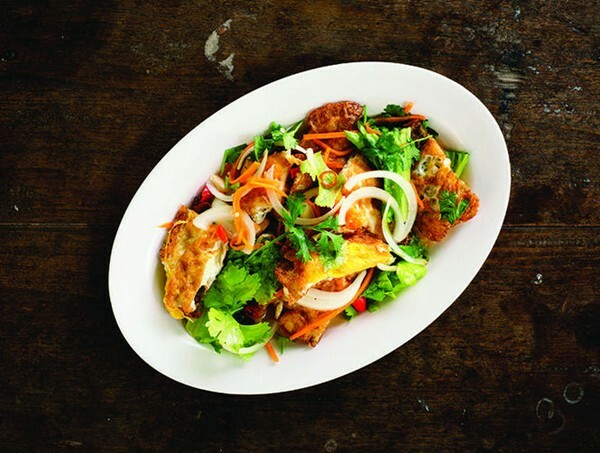 The result is a juicy, aromatic, flavorful chicken with delightfully crispy skin. Ricker's curry paste is far more nuanced than those little storebought jars I've been using all these years, and is certainly worth the effort of pounding. This dish was the easiest I made this week. But, between the pungent chiles and garlic and the funky mix of oyster and fish sauce, it was certainly no less flavorful than the more complex dishes. I was curious how crisp cucumber would pair with the funky, spicy, sour flavors of papaya salad. I loved this salad so much that I ate the entire bowl myself, tiny dried shrimp and all. ...defy expectations (this curry is tangy, spicy, salty, and not sweet or rich), and to make it you'll need to hunt down ingredients like dried puya chiles, Asian shallots, and Thai shrimp paste. This spicy-sour-sweet relish is crunchy and refreshing, and just the thing to perk up your palate. After decades spent traveling throughout Thailand, Andy Ricker wanted to bring the country's famed street food stateside. 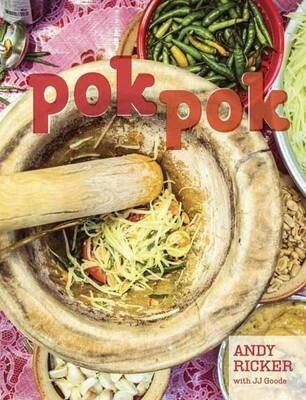 In 2005 he opened Pok Pok, so named for the sound a pestle makes when it strikes a clay mortar, in an old shack in a residential neighborhood of Portland, Oregon. 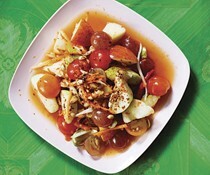 Ricker's traditional take on Thai food soon drew the notice of the New York Times and Gourmet magazine, establishing him as a culinary star. 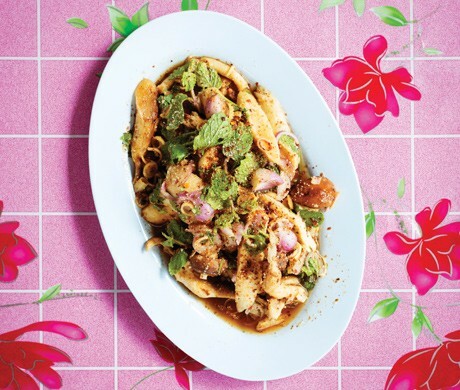 Now, with his first cookbook, Ricker tackles head-on the myths that keep people from making Thai food at home: that it's too spicy for the American palate or too difficult to source ingredients. Fifty knockout recipes for simple and delicious Thai dishes range from Grilled Pork Collar with Spicy Dipping Sauce and Iced Greens to Andy's now-famous Vietnamese Fish Sauce Wings. 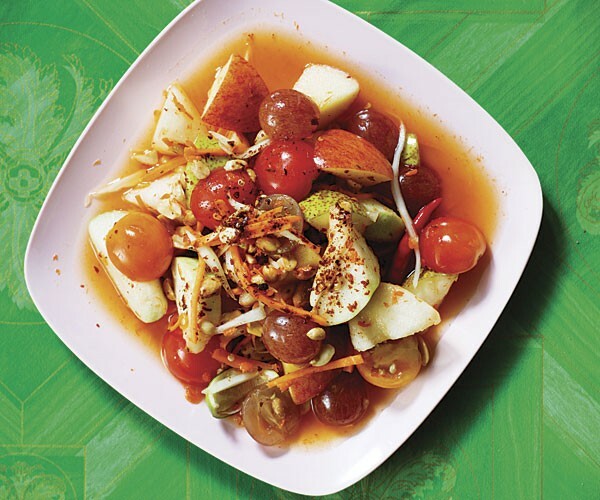 Including a primer in Thai techniques and flavor profiles, with tips for modifying local produce to mimic Thai flavors, Pok Pok makes authentic Thai food accessible to any home cook.